Perfect for even the smallest of kitchen or breakfast bars, the Lulu Real Leather Stool Brown has an elegant style that works with any decor. A real luxury, the Lulu is a sublime merger of exquisite materials, being superbly stylish as well as flawlessly functional. A round seat has sumptuous foam padding that comforts and supports your body, with a raised section at the rear all covered in genuine brown leather. Whilst below this is a steel frame, plated in mirror finish chrome that simply reflects its surroundings. 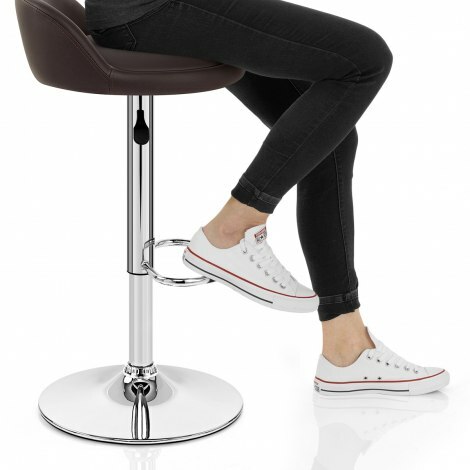 The footrest is a perfectly placed perch for your feet, and houses a hydraulic mechanism that lets you raise or lower the seat to suit your needs, as well as rotate through 360 degrees. The base is stable, with a protective ring beneath that helps to keep scuffs and scrapes at bay, making the Lulu all the more desirable. "Look superb, excellent price and quality"
Look superb, excellent price and quality? Arrived swiftly! Great stools for all ages and sizes - lovely colour. Easy to put together and after over 30 years of sitting on hard wooden stools these are the perfect answer to all of our bodily problems! Fab stools - love them. Great supplier = super fast delivery. Very good product, efficient service with next day delivery. Bought two of these chair for our new breakfast bar, we are really pleased with them they look great and good value for money!!! Dispatched very quickly and arrived in a well packed box. Would definitely use this company again.